Most of us don’t realize that many of the products we use, the foods we eat are causing deforestation on a massive scale in Southeast Asia and are devastating to our planet’s biodiversity. The culprit is palm oil, which is a key ingredient in many common foods, shampoos, soap and pet products, lubricants, pesticides and paints. It even helps fuel our cars. Palm oil has become a silent part of our everyday lives and accounts for 30 percent of world vegetable oil. And that’s how it’s usually identified on the list of ingredients – as vegetable oil so we often don’t even know what we are using. Our consumption of the versatile lipid is soaring. Demand is predicted to more than double by 2030 and to triple by 2050. China is the biggest consumer of palm oil, importing 18 per cent of global supply. In Indonesia and Malaysia, forests are being cleared at an alarming rate, estimated at 2 million hectares a year, wiping out endangered species such as the orangutan, the black sun bear, the Sumatran tiger and many others. The two countries produce 90 percent of the world’s palm oil. 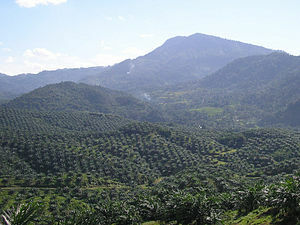 Indonesia already has 8 million hectares of oil palm plantations, but has plans for another four million by 2015 dedicated to biofuel production alone. In total, the country produced more than 23 million tonnes of biofuels last year and is setting aside 18 million hectares to produce much more. Malaysia in 2011 produced 18.9 million tonnes of palm oil on nearly 5 million hectares and was the second largest producer of palm oil. Beyond feeding our snack habit, another challenge for forests is that governments are pushing to increase the use of biofuel, which ironically is seen as a quick fix to reduce greenhouse gas emissions. In the EU By 2020, 10 per cent of fuel will be biofuel, while China expects 15 per cent of its fuel to be grown in fields. But in both Indonesia and Malaysia, in order to plant palm oil, often carbon-rich peatlands are being drained and then burned, releasing stored C02 into atmosphere already clogged with greenhouse gases from razing dry land forests. This represents possibly more carbon emissions than burning fossil fuels. And not infrequently palm oil plantations are just an excuse for clearing forest because the profits associated with sales of tropical timber are substantial. 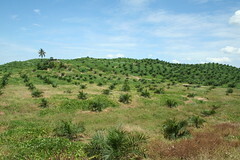 In this case, companies seek concessions and access to land that is forested but don’t ever bother to plant palm oil. We might think that forest and peat swamp loss in Southeast Asia sounds bad but it’s far away so why do we care? We care for many reasons. But if we are thinking purely about self-interest, the effects of forest loss can be seen globally in changing climate patterns and erratic weather. Forest cutting is responsible for 17 per cent of global carbon emissions, meaning this is the third largest source of greenhouse gas emissions and equal to emissions for the entire global transport sector. It is also comparable to the total annual CO2 emissions of the US or China, according to the UK Eliasch Review, “Climate Change, Financing Global Forests”. If the international community does nothing to reduce deforestation, modeling for the Eliasch Review estimates that the global economic cost of climate change alone caused by deforestation could reach $1 trillion a year by 2100. Beyond the effects of climate change from deforestation, we look to forests as sources of vital biodiversity. Estimates are that nearly half of the world’s species of plants, animals and microorganisms will be destroyed or severely threatened over the next 25 years because of rainforest deforestation. As rainforest species disappear, so do many possible cures for disease. At least 120 prescription drugs sold worldwide come from plant-derived sources. While 25% of Western pharmaceuticals are derived from rainforest ingredients, less than 1% of tropical trees and plants have been tested by scientists. We just don’t know enough about the significance of forests to sit back while they disappear. 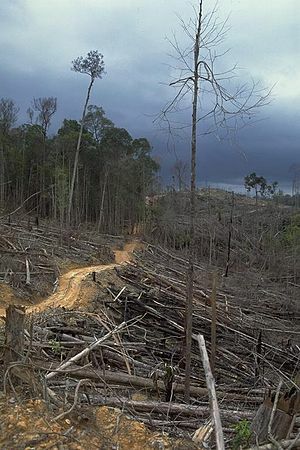 Locally, the consequences of deforestation on such massive scale are even more immediate. Forests help regulate regional rainfall, offer defense from floods, maintain soils and their moisture, and generally offer ecosystem services crucial for maintaining life and livelihoods. Globally, an estimated 1.6 billion people depend on forests for their welfare and livelihoods to one degree or another. So is it worth it to eat that biscuit, that chocolate, choose a shampoo that contains palm oil and how do we know if it’s not even labeled? The rule is that if the label shows the saturated fat content is close to 50%, there is a good chance that the vegetable oil will in fact be palm oil. Among those items that should be immediately suspect are biscuits, processed foods, chocolates and snacks. Other key tip-offs that a food item might contain palm oil listed among ingredients are cocoa butter equivalent (CBE), cocoa butter substitute (CBS), palm olein and palm stearine. When looking at ingredients in non-food products such as soaps and detergents, those that contain palm oil include: elaeis guineensis, sodium lauryl sulphate, cetyl alcohol, stearic acid, isopropyl and other palmitates, steareth-2, steareth-20 and fatty alcohol sulphates. Next time you reach for a snack, paint a wall or fill up your car, do your best to make sure palm oil isn’t an ingredient or at least that the brand claims to use oil from sustainable sources. There are many issues around what makes palm oil sustainable as well as the industry body, the Round Table on Sustainable Palm Oil (RSPO) itself, but this is at least a step in the right direction. A very important subject and yet another example of a world gone mad . Yesterday in the market I noticed no one bothers to look at labels. Getting folks to look at labels is a primary goal. The solution lies in the education of the consumer. For the moment the average consumer is too busy to care. I think that is a big part of the problem Denys – we need to do a better job of educating consumers. Interesting post. Why is more not being done to educate consumers?!! You are so right Denis. Consumer education is one of the keys.